I finally have my new pattern avalible. It is named Sweet Innocence. I love this pattern. There are so many possibilities with it. It includes patterns to make the over dress in 3 different ways, patterns for 2 different peasant dresses and pants in 2 styles. The pattern is sized for children sizes 2 to 6. It has a 15 page pattern sheet included with hand drawn pictures. Hi all. I have had to take my machines into the shop for repair so I need to earn some money to pay for them when they are ready so I am offering a great deal for you on etsy. 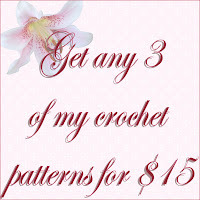 For the crocheters, this is an amazing time to get those patterns you have wanted for a long time. 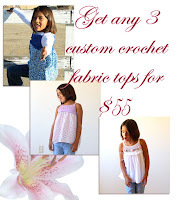 I am offering any 3 of my patterns for $15. My other sale is on my reversible A-line dresses. Normal price for one dress is $45. 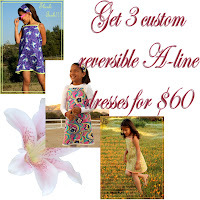 With this listing you can get 3 reversible dresses for $60. I will have to limit the sale items to fabric on hand but you may choose from any of the fabrics that I have. Just email me for pictures of fabrics. some new sand was brought in and with that sand came tons of shells. Selena had tons of fun tossing them into the water during the photo shoot. where you can see more pictures of that item plus a small description. ready in a few days. check your email to finish the sign-up process. Hi all. I've been wanting to find a way for me to communicate with my treasured customers for a while and I have finally taken the plunge and got myself a blog. Please forgive me if it's obvious that I don't have a clue what I'm doing because, I don't, lol. I started this to keep in contact with my customers, let them know what's going on in the world of mytreasuredheirlooms. I will post announcements about upcoming new designs, updates to patterns, and announce sales.